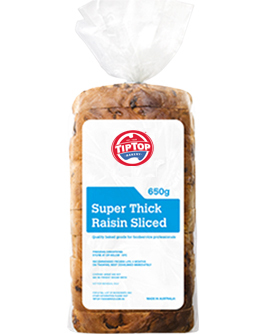 Wheat Flour, Mixed Fruit (30%) (Raisins, Sultanas), Water, Baker’s Yeast, Vegetable Oil, Wheat Gluten, Sugar, Mixed Spice, Iodised Salt, Vinegar, Soy Flour, Fermented Wheat Flour, Emulsifier (481), Vitamins (Thiamin, Folic Acid). Contains: Gluten Cereals and Soy. Store frozen at or below -18°C. Recommended frozen life, 6 months. Once thawed, do not re-freeze and best consumed immediately.